For some reason, not even the smallest of parenting decisions is safe from mom-shaming these days. So, of course, whether you feed your baby all organic homemade baby food, or store bought jars is just another debate. My stance on this is the same as it is with most everything, just do what is best for you and your baby! Make these decisions based on what will make your life simple, happy, and help your baby thrive. With that being said, there are a lot of reasons why I started to make all of Ellie’s baby food at home. But it’s mainly due to the fact that she has an extremely sensitive stomach. I haven’t quite figured out all of her food allergies and sensitivities yet, but have figured out a few things. It seems like at least for now her digestive system is just too immature to handle any food additives or preservatives. She gets sick and throws up for hours after having these. If that’s not motivation to start up a homemade baby food stockpile then I don’t know what is! Only problem was, I had no idea where to start. What foods do I make? How do I make it? How do I store it? Through trial and error I’ve created a system that works really well for me. So if you’ve decided that homemade is going to be the best route for your family, I hope these tips can help you get started! First things first. Based off what age your baby is, decide what foods you’d like to prepare for them. Stage one foods are for babies between the ages of 4-6 months. Since Ellie is so finicky, she’s still mainly in this stage at 8 months. 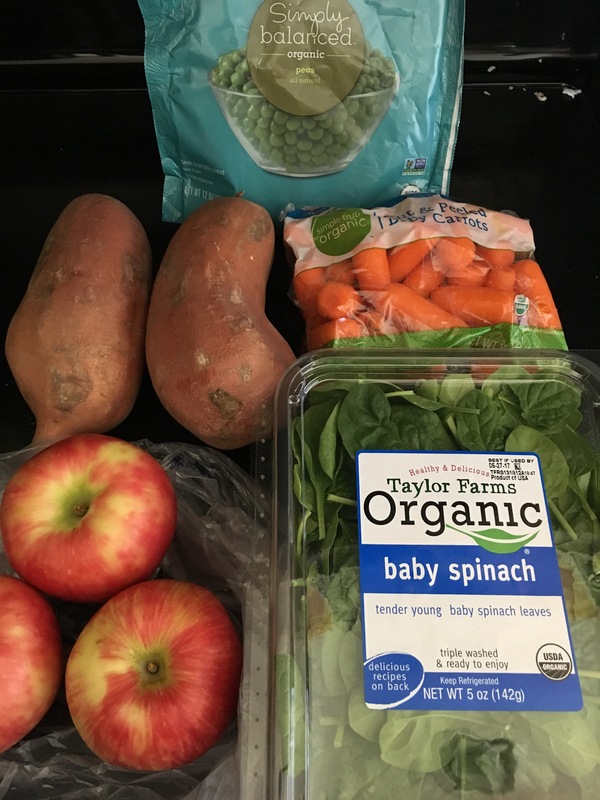 Some really easy stage one foods to make at home are apples, pears, sweet potatoes, butternut squash, carrots, and peas. Other good first foods are avocado and banana, but you won’t want to freeze these. Just pop ’em open and serve them up fresh. You’ll want to make sure that if you’re just beginning solids your purées are very smooth and diluted with water or breastmilk. Stage two foods will begin to introduce baby to a chunkier texture. Next you’ll need to decide how you’re going to make it. Of course, you don’t need any fancy baby equipment to make purées. But, new moms are pretty notoriously low on free time! I personally have really benefitted from buying an all-in-one baby food maker because of its convenience factor. 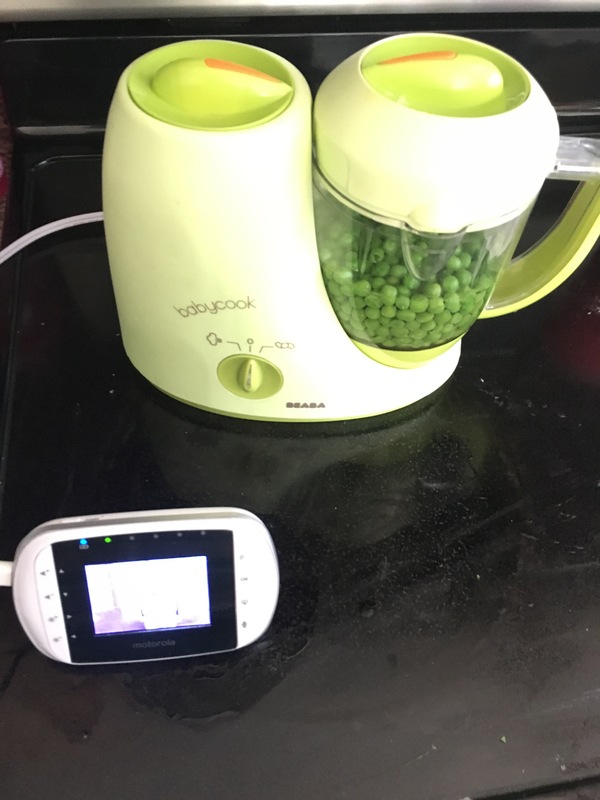 I use the Beaba Babycook to steam, purée, and reheat all in one. It has really streamlined my baby food making process and makes it easy for me to get it all done during nap time! For storage, most commonly you’ll see moms using ice cube trays. This is convenient for measuring out one ounce of food at a time, but inconvenient for storing large amounts of different types of food. 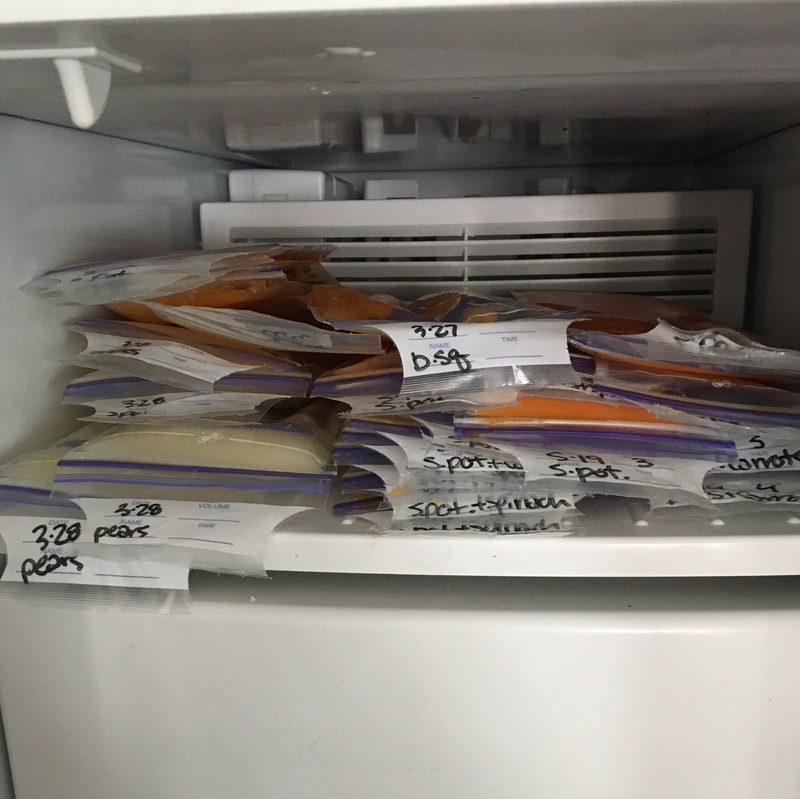 I wanted to be able to clearly store, label and date all my various amounts and types and mixtures of baby food- so I decided to use breastmilk storage bags. Make sure that you’re using frozen purees within 3 months for optimal nutrition, and no later than 6 months total. The other great thing about these is that you can toss them in your bag on the go, like if you want to have some at grandmas’ house. When ready to eat, just run the sealed bag under hot water for a couple minutes and you’re ready to go! 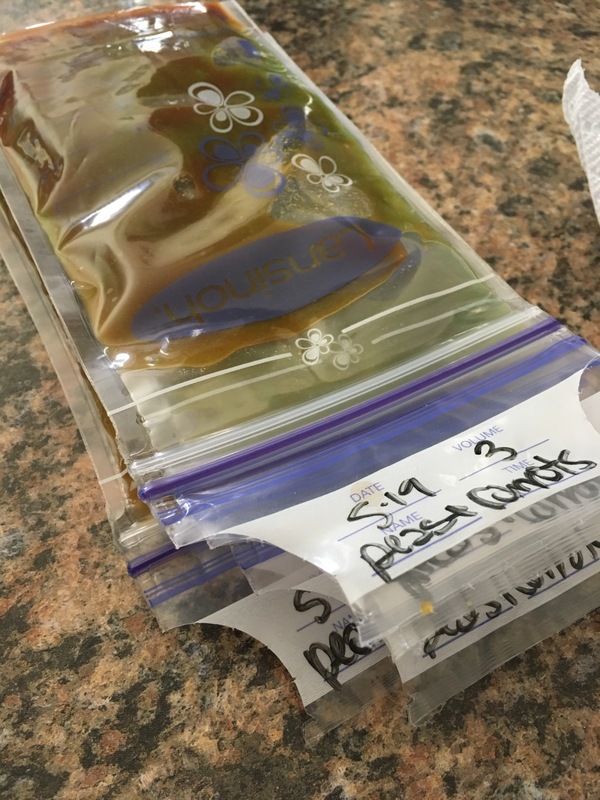 After a successful nap time or two your freezer stash can be just as full as mine with delicious organic homemade baby purees!